These easy sweet potato tofu bowls are a great way to eat healthy while keeping things simple. No need to be overwhelmed with what to make for dinner – get back to basics and enjoy these healthy bowls for a wholesome plant-based meal. Bonus – these bowls pack in 22 grams of protein and 14 grams of dietary fibre each! Cut the tofu into desired shapes and place in a bowl. Toss with a generous splash of soy sauce or tamari and a good sprinkle of garlic powder and black pepper. Lay the pieces on a parchment or silicone mat-lined baking tray. Slice your sweet potato and lay the slices on a parchment or silicone mat-lined baking tray. Place the sweet potato and tofu in the oven at the same time and bake for 30-40 minutes, flipping them both half way through. When the sweet potato is tender and the tofu is nice and browned, they’re done. 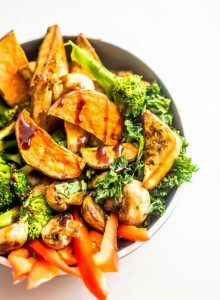 To make the broccoli and mushrooms, add the chopped pecies to a non-stick skillet and cook over medium-high heat for 10 minutes until browned and tender. Only stir or shake the pan occasionally so they can get nice and browned. To make the kale or spinach, use a steamer or just heat in a pan with a splash of water until the leaves are a nice, bright green and just slightly softened. Or if you’re using raw salad greens, just add a bit handful to a bowl then top with the rest of the ingredients. Optional: drizzle with hoisin sauce, sweet chili sauce, almond pad thai sauce, teriyaki sauce, almond satay sauce or coconut peanut sauce.